Chinese company ZTE introduced the Axon Phone in the United States last week & will come soon with Axon Phone Pro in China. Today, finally ZTE the handset maker made an announcement that the upcoming availability of its top-tier smartphone in China, its native country. However, the Axon Phone for China will come with different specs and design, as ZTE especially tailored the device to suit their Chinese market. For example, the standard version of Axon Phone will be available in China with 32GB of internal memory storage, 3GB RAM and 5.5-inch capacitive touchscreen display that will support a full HD (1080p) resolution. The handset will be available to its clients in two different ornamental colors, Ion Gold and Chromium Silver, for just 2,699 yuan, which is about $435 or €395. On the other hand, the updated version of Axon Phone will also feature a faux leather on the back and 128GB of storage inside (expandable to 256GB). This smartphone will also come with fingerprint scanner, but also for the first time with an eye scanner, both of which are missing from the Axon Phone available in the US. 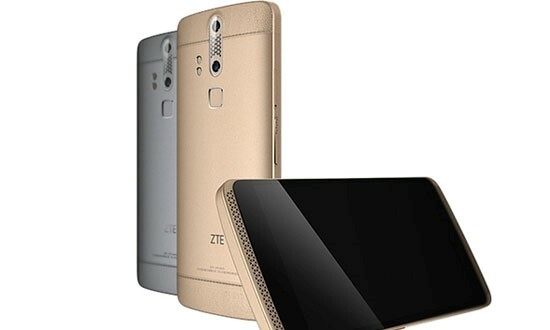 According to ZTE, this is the world's first smartphone to offer users such new biometric authentication options. Apart from that, the Axon Lux will be packed with the same specs as the US version of the smartphone, so we can expect the same Snapdragon 810 CPU paired with 4GB RAM, as well as 5.5-inch Quad HD display. The ZTE Axon Lux will be available for pre-order in China beginning from July 21 for 3,888 yuan outright, which translates into $625 or €570. The smartphone will pack a smaller 5.2-inch AMOLED capacitive touchscreen display that supports full HD (1080p) resolution, but aside from that no other details have been revealed yet. Last but not the least; ZTE has also announced plans to launch an Axon Mini version of its flagship smartphone, which will be available in China in the coming weeks very soon.